The Physics Groupie Blog: Its Galactic Center Season! With the arrival of the spring and summer months, most people look forward to vacation time, outdoor sports, spending quality time at the beach (for us So Cal SLBers), and any one of a plethora of other fun activities. For others, like some astronomical researchers I know, this time of year means it is Galactic Center observing season. From the northern hemisphere, the best time for observing the core of our Milky Way is during the summer months, so this means that researchers who train their telescope at the Galactic Center are typically hard at work during this time of year. Take the UCLA Galactic Center Group for example. Black hole hunter Andrea Ghez heads up one of the foremost groups for Galactic Center research. The team just celebrated “opening night” of the Galactic Center observing season with their first scheduled observations of the area surrounding the Milky Way’s supermassive black hole (the central parsec) using the Keck II 10-meter telescope on the summit of Mauna Kea, on the Big Island of Hawaii. The results were spectacular, and they collected what Professor Ghez described as “an unbelievably good set of data.” Data collected during Keck observing sessions are food for researchers for months, even years into the future. So a truly robust set of data is sort of the holy grail of astronomical observation. 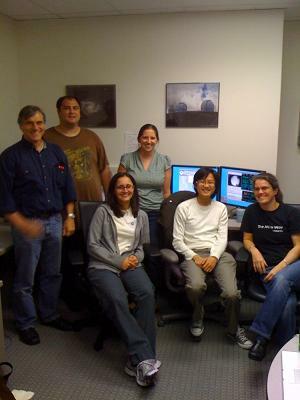 Fortunately, the members of the group can utilize the Keck telescope from the comfort of a nice remote observing room right on the UCLA campus. This saves the long trip to the Big Island and allows for a more streamlined observing process, not to mention being easy on the grant budget. From the remote room, the researchers work closely with telescope operators physically at the Mauna Kea summit via a real-time video conferencing system. Based on the season, and physical location of the telescope, the researcher’s telescope time is necessarily scheduled for the wee hours of the morning. Much devotion is needed to carry out these work hours, but in my estimation this is a small price to pay for seriously contributing to the advancement of our understanding of the universe.